Writing this at our bed and breakfast outside of Château-Thierry. We rode 23.63 miles today. It is 7 am Sunday morning. We are situated in a historic farmhouse on the outskirts of the village of Chierry. In a few hours, we will start a ride to visit places where my cousin Harry Swift fought with the 168th Regiment of the 42nd Division (Rainbow Division) in July 1918. Just before our meal arrived at the table, we heard squealing tires followed by a couple of loud thumps. The hostess and chef of the place darted outside and up the steps to the street, and Steve quickly followed. Fortunately, it did not involve any injuries, but wrecked the little blue sports car which had come flying across the bridge, and without pausing at the stop sign at the end of the bridge, had tried to negotiate a left turn onto the highway. It wasn't clear to Steve whether or not the car had clipped another vehicle, but it certainly mashed its right fender on the stone wall on the right side of the highway and somehow also dented the left side of the car. Relieved that the outcome was not more dramatic and did not involve injuries, Steve reported the details back to me, and we went on with our dinner. Earlier, while I was propping the menu up at the end our table so that Steve and I could both see it, the salt and pepper shakers behind the menu got scooted off the table and fell on the floor. The salt shaker broke, spilling salt and glass onto the floor. We quickly apologized for my clumsiness, but after the car accident, Steve began thinking that the spilled salt was a bad omen, so he put a little salt in his palm and tossed it over his left shoulder. Intersection in Nanteuil-sur-Marne - our lodging is the red-roofed building on the right at the end of the bridge. While eating dinner, we heard an accident on the street. A car coming across the bridge failed to stop and tried to execute a left-hand turn. After dinner, we were too full to sit or lie down, so we took a short walk in the village. It's not a very big place, so it did not take us long to reach the edge of town and look eastward down the valley toward our route for the next day. We have now entered a region where the banks of the Marne sweep upward in long, steep hills. Here at Nanteuil-sur-Marne, the northern bank was covered with vineyards. We could see down the long valley to the east that little villages were interspersed among farmland and forests. The gardens in the village are garnished with roses in full bloom. The bushes are replete with perfect blossoms, larger than most I have seen and in a variety of colors. The yellow ones catch my eye, but there are endless shades of others. I stopped at one place, where a bower was draped with a cloak of red roses, which though beautiful and numerous, did not seem to have a strong fragrance. We meandered back through the town, looking for the church, and finally found it in a back street. The sign at the door indicated that Masses are said there once a week, but that churches in nearby towns had a more active schedule. So we assumed that this parish is small and perhaps shares a priest with two or three other churches. It was around 10:30 when we went to bed, and the next morning we were at the breakfast table by 8 am. The hostess served us homemade mirabelle (plum?) preserves, warm croissants, and steaming hot coffee. We lingered a little over the coffee then packed up our things, paid our bill, thanked the innkeeper and said au revoir. We were glad to see that the Saturday morning traffic on D403 was not heavy, and we pedaled off in the direction of Château-Thierry. Our planned route was along highway D969, which we were to pick up in the first village down the road, Crouettes-sur-Marne, but we opted instead to seek out the bike trail along the river. After scanning the horizon the evening before, we deduced that the highway would take us up the hills and through the villages but the path along the river would avoid both the hills and the cars. It was pleasant along the Marne, where we could hear the birds and were far from the car traffic. 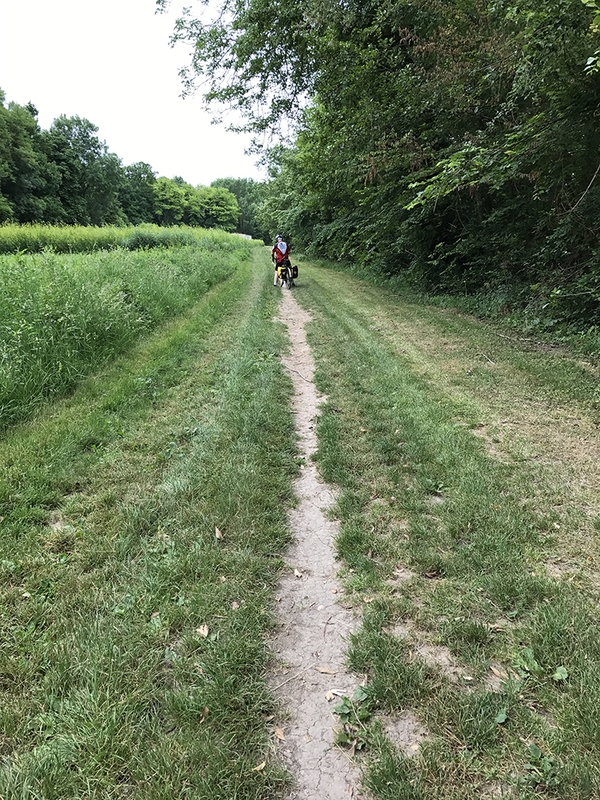 But the surface of the trail varied from pavement (rare) to gravel, to ruts or sunken spots filled with rock, and sometimes dwindled down to a single track across a stretch of a grassy area. But it was mown and clearly intended for use by hikers, bicyclists, tractors or cars and perhaps horses, judging from an occasional road apple. We were not able to ride with much speed and, in places, had to give our full attention to the surface in front of us because our loaded bikes, while equipped with sturdy wheels and tires, are not particularly nimble and easy to balance with an unexpected move. Nevertheless, we were content with the thought that we were avoiding hills and cars, which we knew we would have to deal with before the day was over. In the end, we rode the river path only a short distance between Crouettes-sur-Marne and Romeny-sur-Marne, and then we rejoined D969. 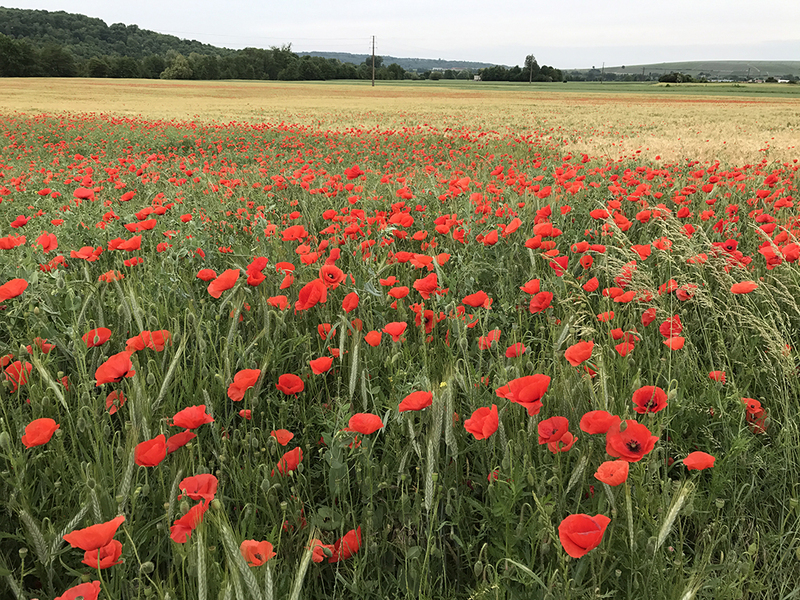 But an added bonus was finding some rye and wheat fields strewn with poppies, which we stopped to admire and photograph. I paused to remember my friend Esther Morrison, whose family is celebrating her life today in Illinois. Esther was from my hometown, and she was grand lady -- always cheerfully offering her time in volunteer causes and particularly in support of the Arenzville veterans. I remember buying a poppy from her as part of Memorial Day remembrances which I was a grade school student. She lived to the age of 101 but died a few months ago. Her family planned a celebration of her life for today, and though I could not be there to celebrate with them, she was on my mind. For a friend who meant a lot to me. Once back on D969, we climbed to a point which offered another spectacular view of the valley to the east. We stopped at a wayside park which provided a panorama and some signage to inform us of the names of the villages we could view in the distance. From our vantage point, we could see a small dam on the Marne below us, vast fields of wheat and rye, and vineyards where the sloping hills offered good drainage. From Romeny-sur-Marne to Azy-sur-Marne, we rode with only light car traffic, but it picked up as we got closer to Château-Thierry. Most drivers were patient with us and waited for the proper opening to go around us, but some were eager to get by us and made their move at times which I would have preferred they did not. It wasn't particularly annoying, but less experienced riders would not have enjoyed it at all. 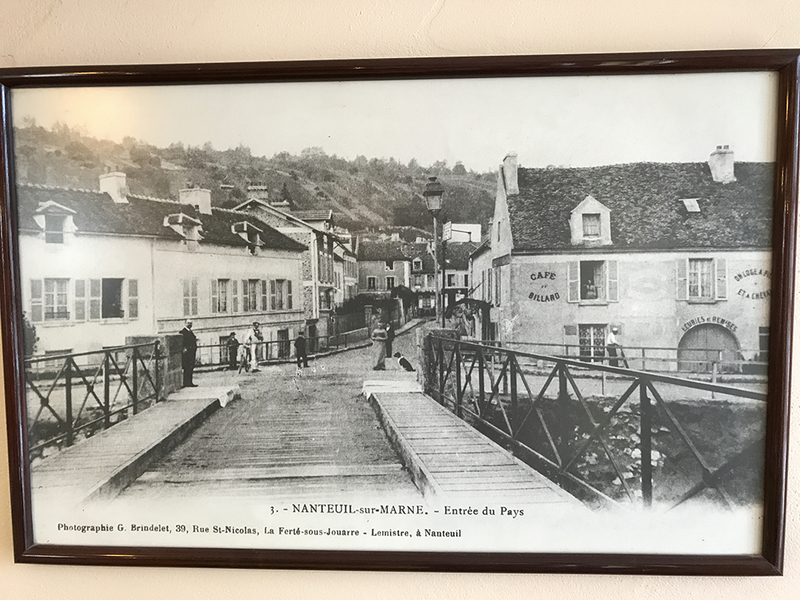 When we reached the town of Essômes-sur-Marne, we paused for a break and found a boulangerie (bakery) to buy a sandwich and some cold drinks. Steve selected a perfect choice of a ham sandwich with boiled egg, pickles, lettuce, mayonnaise (or was it butter? Or both? ), and we split half of it. These are foot-long sandwiches, and neither of us really wanted a big meal at that point because we knew we had a long climb coming up. It was pleasant standing at a table in the bakery eating our lunch because we could view the goings-on of the bakery and admire all the other creations without having to endure the consequences of the calories. At one end of the long counter before us, a man who appeared to us to be the twin to my friend Karmen Kruse, was working at a pizza oven, cleaning it after having produced several pizzas which were sold warm or cold. Two women worked at the counter with the breads and pastries, and a steady stream of customers came in to pick up orders or make selections. This is the beginning of a holiday weekend in France, when tradition calls for "picniques" as part of the celebration of Pentecost (Whitsunday). Monday is a holiday, but Sunday is a day when many locales have a local picnic celebration with concerts and meals. So we assumed that some of the boxes of goodies being carried out of the bakery could be for family gatherings as part of the weekend. On top of the glass counter were three white loaves that attracted my attention. They weren't bread, but I couldn't quite make out what they were until I stepped over for a closer look. 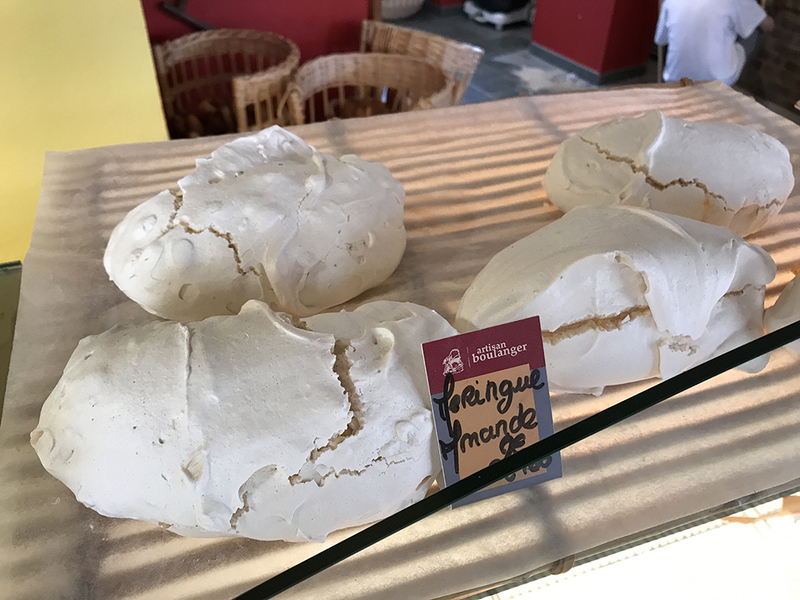 They were long puffs of baked almond meringue, about 8 inches long and 4 or 5 inches tall. I could see a tiny crease of golden filling and assumed that some sort of almond treasure lay inside. We finished our lunch, went back out to our bikes and consulted the map. From here, we were starting a circular route to get to the top of Cote 204 (Hill 204), where the American Memorial sits overlooking Château-Thierry. It commemorates the French and American soldiers who fought the Second Battle of the Marne (which most Americans knew simply as the Battle of Château-Thierry.) It was really a series of battles over a period of months. The action started when the Germans began driving toward Paris in July 1918. Their strategy was to split the Allied lines, and their rapid progress alarmed everyone. The French troops, already battle-worn and weary begged General Pershing to commit the divisions who had only just arrived in France and were not yet fully trained. Pershing was reluctant because the troops were relatively untested, but he finally relented with the condition that the American officers would command their own troops. Cote 204 is the high ground over the city of Château-Thierry, but the crucial battles were fought down in the city and to the north and east (particularly at Belleau Wood and Croix-Rouge Farm and to the northeast at the River Ourcq and the Aisne.) 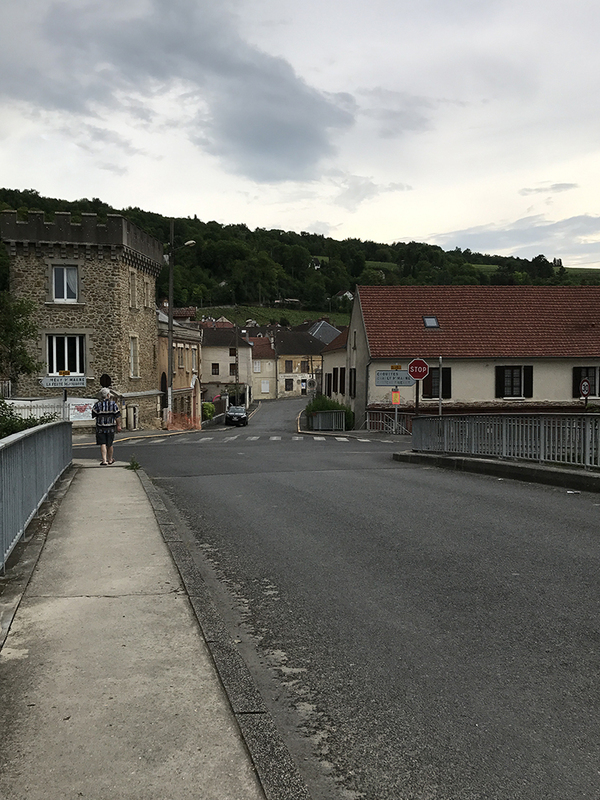 To reach Cote 204, we rode up a steep back street and through the villages of Moncourt, Monneaux, and Vaux, to reach highway D1003. Another long climb up the highway brought us to the entrance of the memorial grounds, and we pedaled down a long avenue toward the memorial. 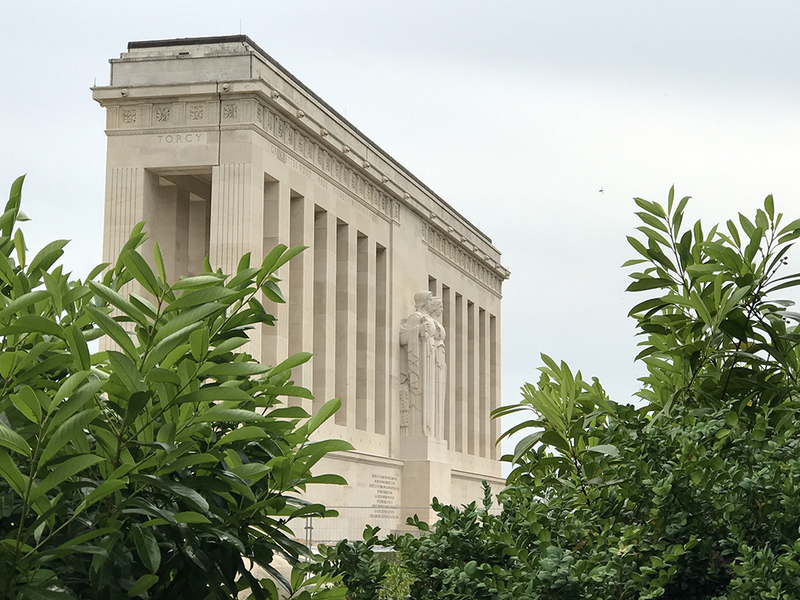 We were only slightly disappointed to find the memorial enclosed with tall sections of construction fence, but it is easy to understand that the renovations and cleaning currently underway are being done so that the place will look its best next year in time for the centenary of the battles. We were still able to view the massive structure in all its glory, though not without the intruding scaffolds, crane, and piles of materials for replacing worn or damage stonework. The monument is impressive, somber and inspiring. 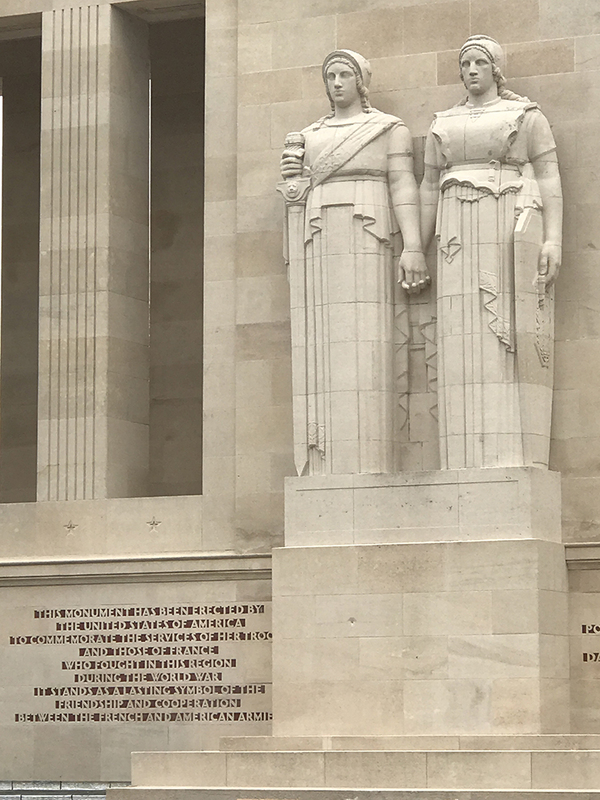 On the west side of the monument are the allegorical figures of America and France, standing side-by-side, with one holding a sword and the other a shield. Around the top of the monument are inscribed the names of places where decisive battles took place, and around the base are the names of the divisions which participated. On the eastern side is an American eagle and shield above the inscription, "Time will not dim the glory of their deeds." Below that is a map inscribed in stone of the region with key sites and division numbers indicating the course of the battle. With the Germans only 50 miles from Paris and evacuation plans underway, Pershing committed 8 American divisions to the Second Battle of the Marne. The US 3rd Division joined the French 10th Colonial Division to defend the bridges on the Marne at Château-Thierry. When flanking units retreated, then Division Commander, Major General Joseph Dickman, told our French allies "Nous Resterons La - We shall remain here." They held the ground and kept the Germans from crossing the river, earning the eternal gratitude of the French and giving the division the name by which it is known today -- the Marne Division or the Rock of the Marne. The stand by the 3rd Division, the actions of the Marines at Belleau Wood, the tenacity of the 26th and 42nd Divisions northeast of the city, and heroic actions by the other five American divisions during the months of July and August of 1918 stopped the German advance on Paris. From this point in the war, the entrenched lines were broken and the Allies pushed the enemy westward. Though a few German troops reached the south bank of the Marne, their army never made it across. It was the final German offensive of the war. Even their own commanders recognized that the tide had turned. A few days earlier, they had expected to be receiving peace proposal from the Allies. "‘That was on the 15th,’ the German Chancellor, Georg von Hertling, later wrote. ‘On the 18th even the most optimistic among us knew that all was lost. The history of the world was played out in three days.’” So that is why we huffed and puffed our way to the top of Cote 204 and paused at the monument to reflect. We walked around the entire thing and on the eastern side admired the view across the valley with Château-Thierry sprawled below us. 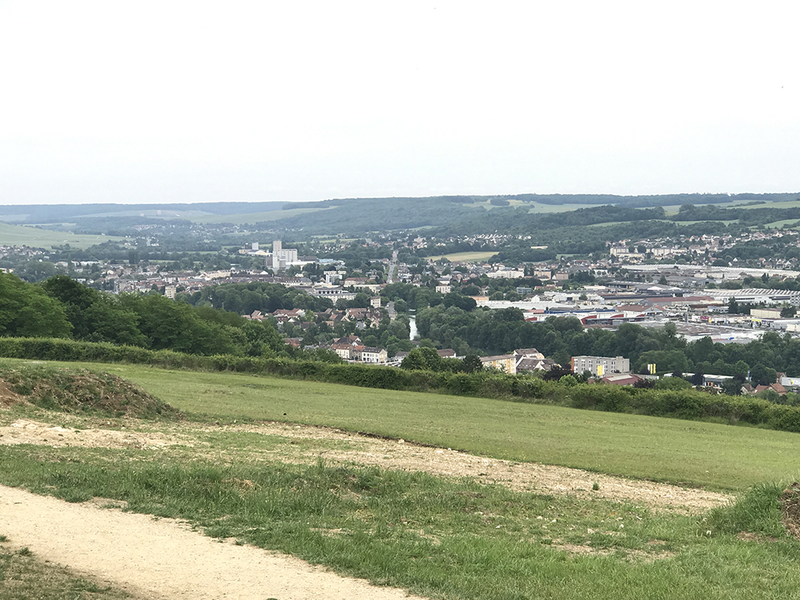 One can see for miles from this vantage point, and the beauty of the valley makes it hard to imagine what it must have been like 100 years ago, when so much of the city lay in ruins from the occupying German troops and the Allied shelling to drive them out. 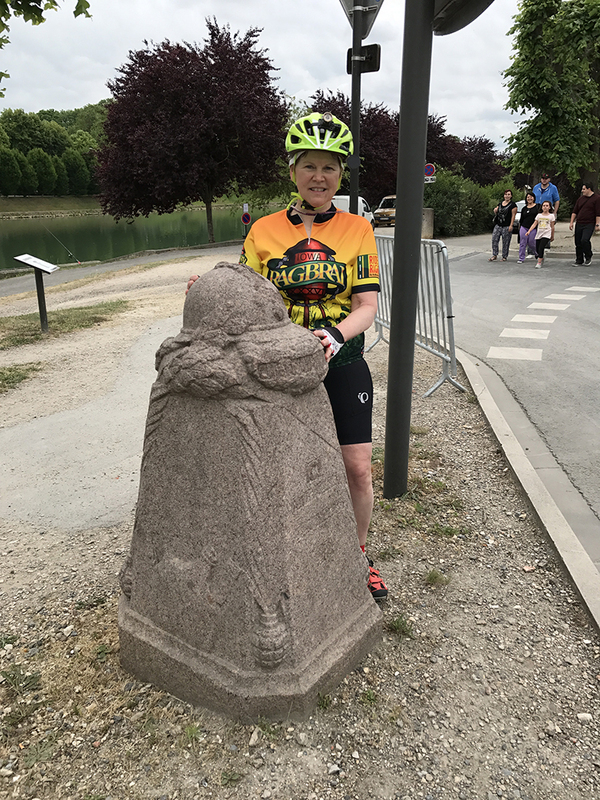 After leaving the American monument, we rode a long and speedy descent to the valley and blended in with the traffic on the streets of Château-Thierry as we pedaled along the northern banks of the Marne. Near the center of the city, we stopped to look at the memorial to the 3rd US Division. The granite tableau which stands there today is actually the second structure placed there in their memory, the first one having been destroyed in 1940. It stands in its own little plaza area, with flowers and greenery around it, facing the river where the division made its stand. Across the street and a few meters further east stands a Demarcation Stone, placed there by French and Belgian auto touring clubs in the 1930's. They planned a series of markers along the western boundary of the front of the Great War to mark the lines where the enemy was stopped. The first stone was this one, placed in Château-Thierry. Some of the stones were destroyed in WWII, others damaged by accident or simply neglected and succumbed to the effects of time and nature. The one in Château-Thierry is clearly worn and the detail on the stone smoothed, but a nearby placard explains its significance. 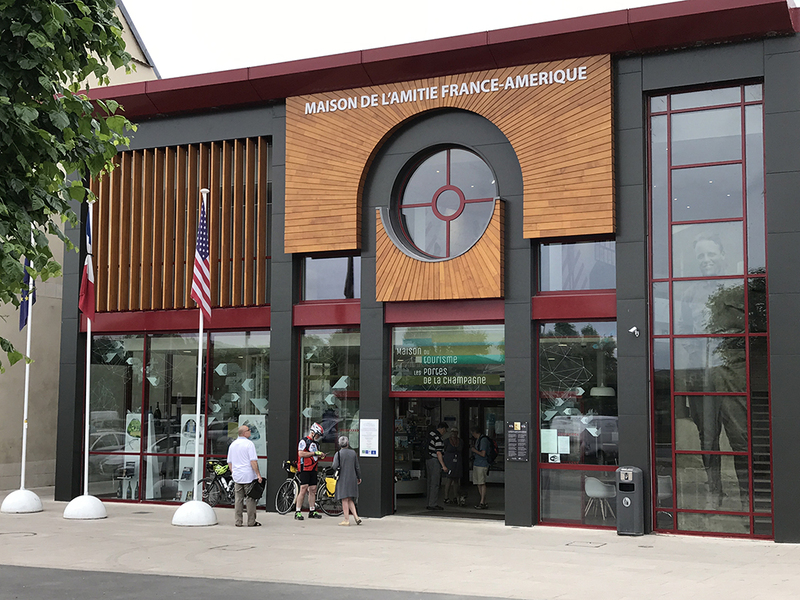 We crossed the street and went to the Maison Franco Américaine or MAFA (House of American and French Friendship) and tourist office, to ask about the location of another site in the city -- the American Memorial Church (https://americanmemorialchurch.com/.) The young women working at MAFA were very helpful and interesting to talk with. They were knowledgeable about the history and the sights in the city that we wanted to see, and we appreciated their guidance. We also found some excellent maps in the shop there and purchased two of them for our ride tomorrow. They are maps made primarily for hikers, so they offer detail on a smaller scale that is useful for our selecting routes around the countryside. Today's MAFA is a brand new facility, built just a few years ago on the site of the first MAFA which was established immediately after the war's end but had become rundown and difficult to maintain. It houses an exhibit about Quentin Roosevelt, son of president Theodore Roosevelt, who served as a pilot in WWI and was killed in a crash not far from Château-Thierry. It was reported that German troops gave him a military burial at the crash site. For many years, his resting site remained there, marked by a marble stone and visited by thousands who knew his story. When his brother, Theodore Roosevelt, Jr., was killed in WWII in the Battle of Normandy and buried at the American Military Cemetery at Omaha Beach, the family requested that Quentin's remains be moved and buried beside his brother. Informed by the guides at MAFA that the American Memorial Church was just a short distance away, we walked our bikes about a block to the town hall square, where the church sits on the northwestern corner. 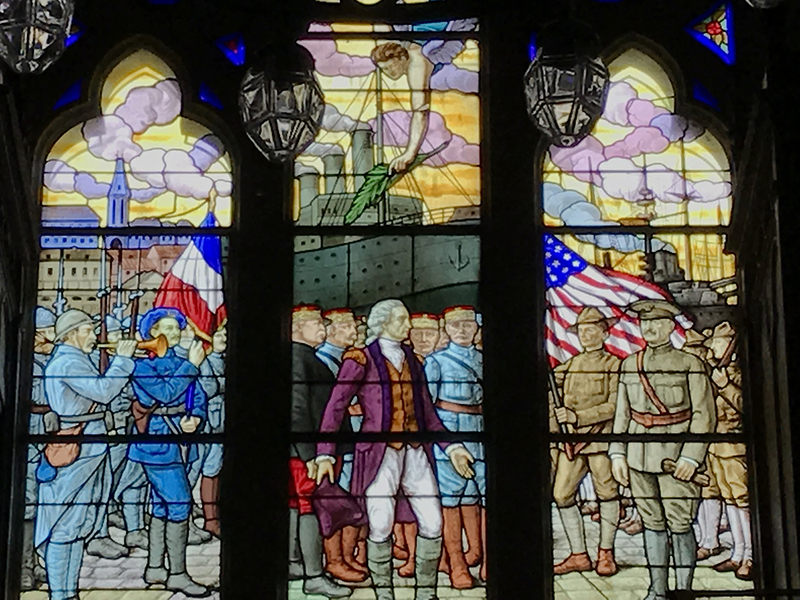 I was most interested in the remarkable stained-glass window in the church, which depicts an allegorical meeting of Pershing and Lafayette, recalling the arrival of the American troops in Paris in 1917, when an assistant to General Pershing made the famous remark, "Lafayette, we are here." The establishment of the church is a bright spot in the war tributes at Château-Thierry because it celebrates peace and friendship rather than war or conquest. The church was built with American funds and donated to the reformed Protestant Church of France. Many of the furnishings of the church were donated by American families or organizations, in memory of soldiers or chaplains who served in the armed forces. The pulpit, a table, a lectern, a pew -- these and others items bore a small brass plaque inscribed with the names of donors and the soldier whose memory was being recalled. The docents at the church spoke English and eagerly explained to us the church's history and the symbolism depicted in the stained-glass window above the choir balcony. When I walked up the aisle of the church, I did not see the window, but as I turned to look for it in the back of the church, the docent immediately took notice that I was interested in it. "This window is not well known," she said, and explained that many of the visitors to the city do not know about the church. She and the other docent -- her husband -- are caretakers for the church were very appreciative of our interest. Likewise, we were grateful for their explanations and some photos and literature we were able to pick up there. We made a donation to their church before we left, since they are trying hard to raise money for the church's upkeep and preparation for the 100th anniversary. As we departed the church, two men at the door also began chatting with us. They were there to welcome visitors, too, and had been on hand as we viewed an exhibit in a small room adjacent to the church sanctuary, where artifacts from the war were displayed, including uniforms and personal items from American soldiers. As we chatted with those guides, who were curious about our bicycle trip, the docents came out and chatted with us some more. The husband of the docent pair brought me an old postcard photograph of the church and gave it to me because it was an image of the church when it was first erected in 1924 and he wanted me to have it. By now, we were starting to feel some raindrops and we still had about a 30-minute ride to reach our B&B, so we said our au revoir and began pedaling. 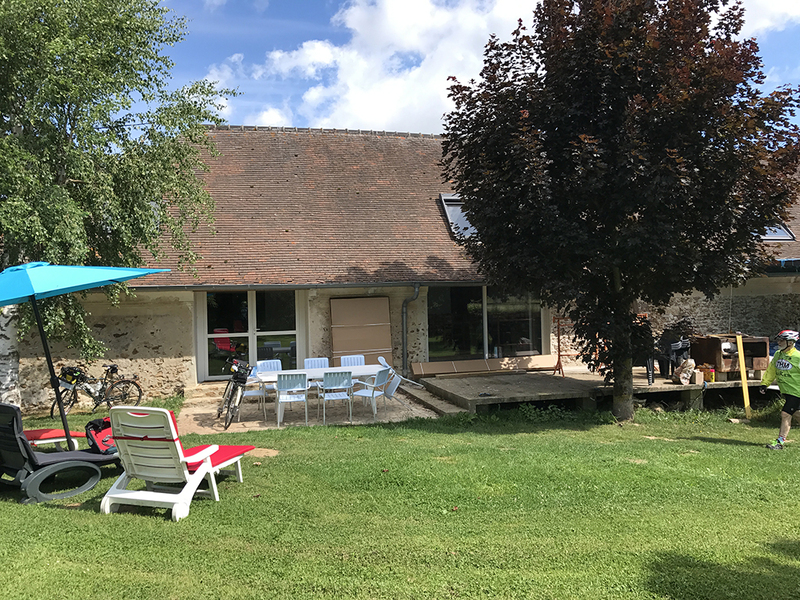 Our lodging is on the outskirts of Château-Thierry, which meant a long climb up out of the river valley and onto the plains. 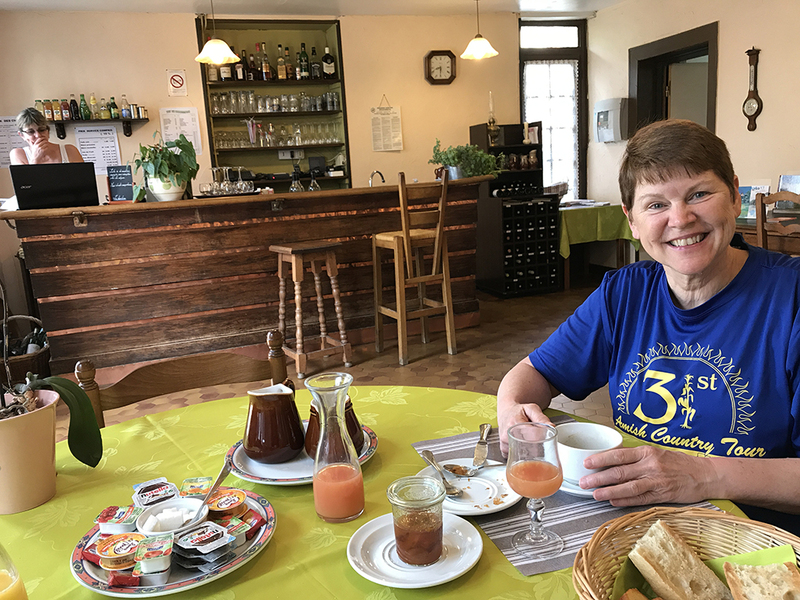 We crossed the River Marne and rode through the small village of Chierry and then made a 1.5-mile climb to reach "La Fontaine aux Charm," the 17th century farmhouse of the French author, Jean de la Fontaine, known for writing many fables (e.g., the tortoise and the hare, the fox and the raven, etc.) In fact, the breakfast room of the B&B is the very room where he authored many of his works. Our bedroom is just off that room, in a cozy area with beautiful stone walls, stone floor and deep window sills of natural wood. Once we got to our room, Steve and I did our laundry and showered, feeling much refreshed afterward. The B&B hosts gathered us all for an evening meal at the table in the room next door, and we were fed a scrumptious first course of a baked cheese pie, followed by a main course of a sort of beef stew with a wedge of a lighter cheese gratine (with a texture and flavor somewhat like polenta.) That was topped with dessert of a fresh fruit torte and offers of cognac or rum. I wasn't able to keep up and could not finish the full serving of my entree and barely managed the dessert. But the cognac wasn't a problem. The conversation around the table was half French and half English, with the couple from Paris only reluctantly speaking much English at all, and we being pretty well incompetent in speaking French. But it was nevertheless convivial and ranged on many topics. The three young men from Nice and Paris -- Nicholas, Paul and Williams -- were particularly good company, and we enjoyed the evening. We retired around 11 pm, with an agreed arrangement for breakfast at 9 am the next morning. At that point, I could hardly think about more food, but our planned ride tomorrow is about 30 miles with a considerable amount of climbing up and down the hills, so I think I will burn off a few calories. The internet signal here has been at times weak or non-existent, so I have not been able to post as many photos on Facebook as I did on Friday. Perhaps the next night's lodging will offer a better chance for me to catch up. Don't mix politics and fromage. French-American friendship is very much still alive.